Took an early flight yesterday for a series of #88lovelife events in Jogja this weekend. Jogja has been wonderful, like always. Everything was so warm and lovely. The weather was nice as well, which makes the trip even better. This time Diana and I started the book visit by having a talk show at Universitas Negeri Yogyakarta. We are collaborating with Emina for our visits to various cities, Jogja is one of them. So it wasn't only our talkshow, but there was also a beauty workshop by Emina. You can check about our collaboration more on instagram with hashtag #88lovelifexemina. Our 2nd stop was the book signing at Ambarrukmo Plaza. It was lovely, lots of readers came and I can actually feel the enthusiasm towards our book. For #88lovelife vol. 02, the talk show is even more interesting because Diana and I are not only talking about the book, but also our activities, stories about dream and passion. I'm more than happy to share my thoughts because somehow it helps me learning about myself too! We stayed at Lokal, the same hotel as last year. I love Lokal because everything is well curated and local made. The blanket is very soffffttttttt, I wish I could take them home with me. This morning we ended our visit by having a private brunch with our readers. So Diana and I previously held a blog competition for our readers in Jogja. Emina also did a mini quiz on their side, to select 10 girls to join our brunch. I was really excited about the brunch. Jogja is actually the reason why we think that we need to have an intimate brunch with our readers. 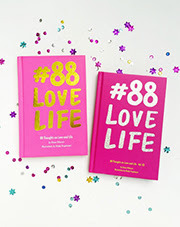 Because last year, we had so many readers came to our #88lovelife vol. 01 book signing. So many readers, so little time. We didn't have the chance to talk and to know what our readers think about the book. So for the 2nd volume, Diana and I decided to have a private brunch with our readers, so we can spend more time with our readers. Here are some pictures from the series of events, more on Instagram you can check the hashtag #88lovelife, #88lovelifesoiree, #88lovelifexemina. Kak Dinda, I`m sooo exciting about #88LOVELIFEsoiree in Bandung. I can`t wait to share my #88LOVELIFE feelin` on my blog. Thankyouuu.